This weekend we’re visiting Matt’s brother who lives in Paris, the lucky bugger. 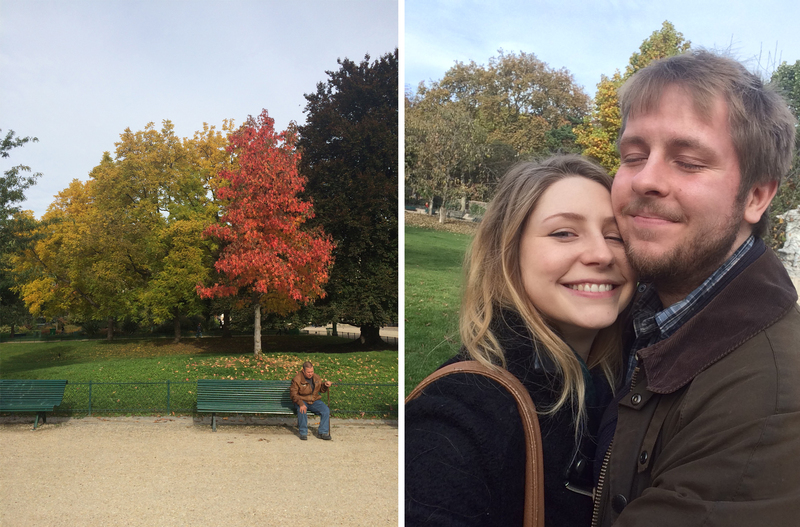 Since this is actually our second autumn weekend in Paris since we started dating, I thought I’d take the opportunity to look back on the previous trip. Wondering where to go for a weekend away this autumn? This post is for you! 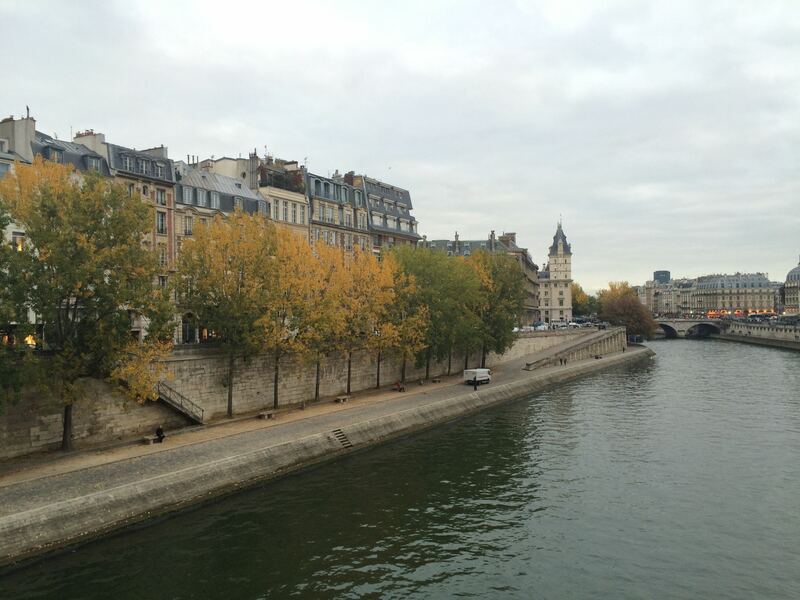 With all the parks and their yellow leaved trees, and all the galleries and museums in case the weather lets you down, I’m of the opinion that Paris is the perfect city for a November getaway. 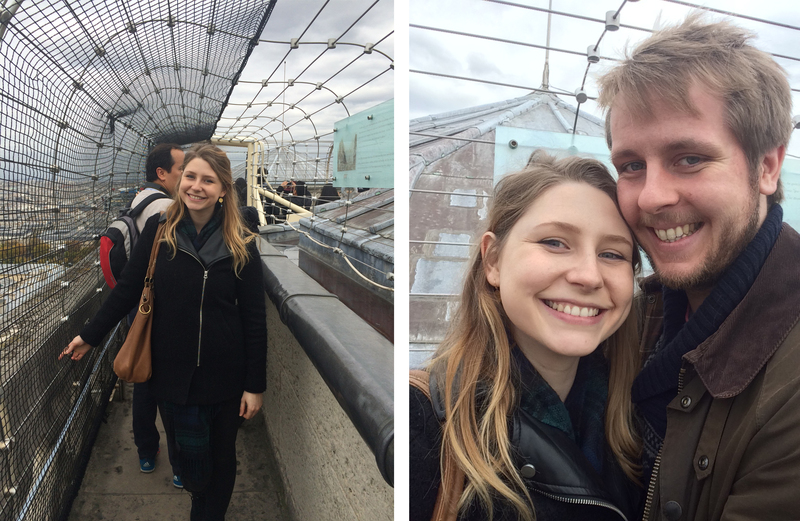 For our 2015 trip we stayed in an apartment in Odéon (I won’t link the airbnb as we weren’t that impressed with it to be honest), south of the Seine and walking distance from Île de la Cité. 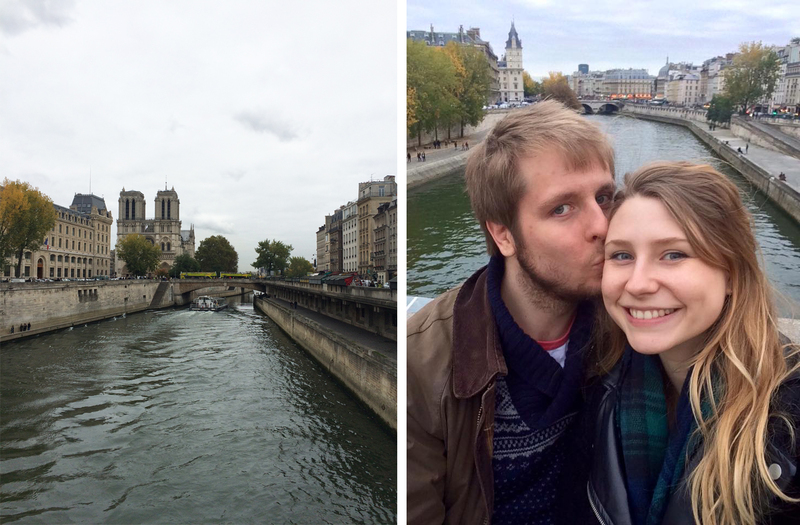 We stayed in le Marais for both of our other trips to Paris, so this was something a little different for us. Left: Cour du Commerce Saint-André. Right: Metro stop Saint-Michel. 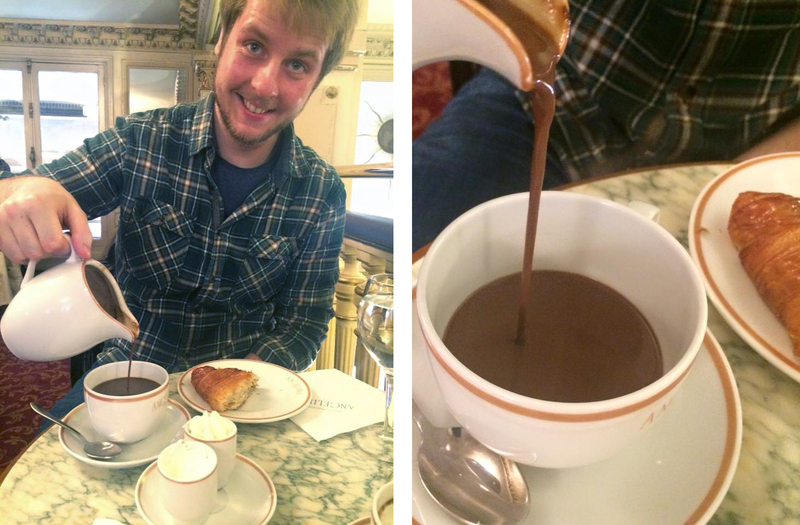 The first thing we did on our first day was head to my favourite hot chocolate joint by the Tuileries gardens – Angelina. If you’ve read my post Where to go on your first trip to Paris, then you know how I feel about Angelina’s. It’s best to arrive early to mid-morning, as the queues here build up really quickly. Matt pouring his hot chocolate at Angelina’s. Made with a secret recipe from three types of African cocoa, Angelina’s hot chocolate is the thickest, richest and smoothest that I have ever indulged on in my whole life. Nothing is more filled with promise than a full jug of velvety melted chocolate and a small cup of whipped Chantilly cream, waiting for you to mix at the ratio that you desire. Is there any better way to warm up on an autumn morning? Located in the old orangery of the Tuileries Palace just by Place de la Concorde, the Musée de l’Orangerie is a great bite-size museum perfect for getting a taste of French art without having to venture into the Louvre. Inside you can view masterpieces by Paul Cézanne, Henri Matisse, Pierre-Auguste Renoir and Henri Rousseau, and most famously Claude Monet. The Musée de l’Orangerie is home to Monet’s eight large murals Water Lillies, also known as the Nymphéas, and you couldn’t imagine a better way to view them. Money himself worked with the head architect at the Louvre to design the oval rooms using natural light, plain walls, and sparse decoration to best display them. The end result is hard to describe, so I’ll just say again – visit this museum! Number 1 tip for the Musée d’Orsay: book your tickets online otherwise you will be stuck in a queue for hours. Left: Inside the Musée d’Orsay. Right: Fontaine Saint-Michel. I’ve always loved the Musée d’Orsay. When we lived in Paris we would often visit with our sketchbooks and sit in front of the sculptures for hours drawing. My favourite was always the world-famous Little Dancer aged 14, one of the 23 series of original bronzes cast from five wax models found in Edgar Degas’ studio after his death in 1917. 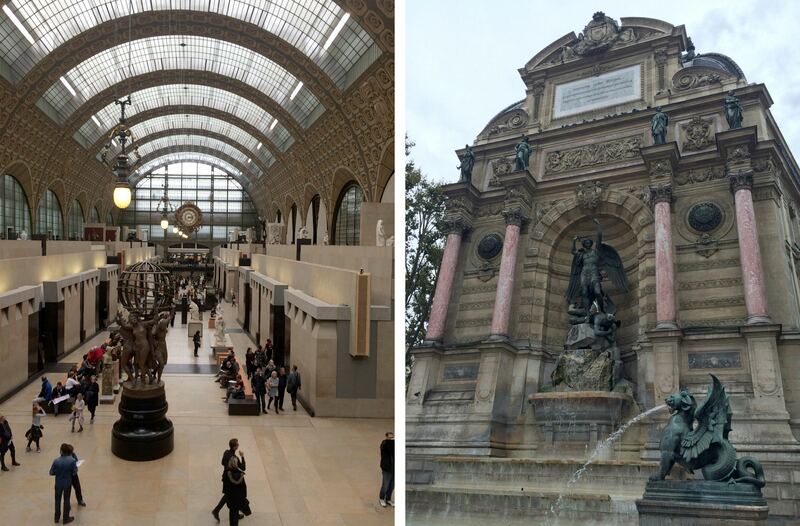 The other fascinating thing about the Musée d’Orsay is its origin as a railway station. Built in 1900 for the Exposition Universelle, it was a functioning station until the late 1970s, and reopened as a museum in 1986. It still has the distinctive arched roof of a station and that huge clock at the far end of the main hall. Musée d’Orsay as a functional railway station. The Île de la Cité is literally the heart of Paris. A natural island in the middle of the Seine, it is where the medieval city was refounded and has been the site of Paris’s main cathedral since the 10th century (Notre-Dame’s ancestor). The view of Île de la Cité from Pont de la Tournelle. In fact, the whole eastern end of the island has been consecrated to religion since Merovingian times, with a palace on the western side. The middle of the island holds the Prefecture de Police, Palais de Justice, Hôtel-Dieu hospital, and Tribunal de commerce. There’s also a memorial to the 200,000 people deported from Vichy France to the Nazi concentration camps during the Second World War on the western most end. The view back to Île de la Cité from Pont Neuf. 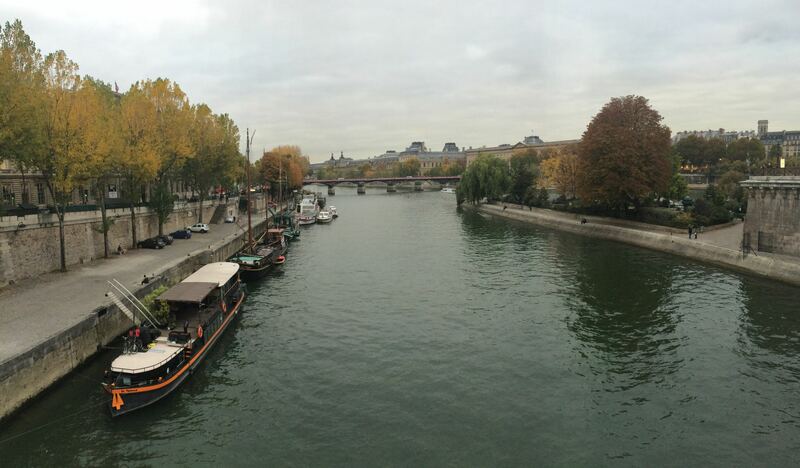 Left: The view from Pont Saint-Michel. 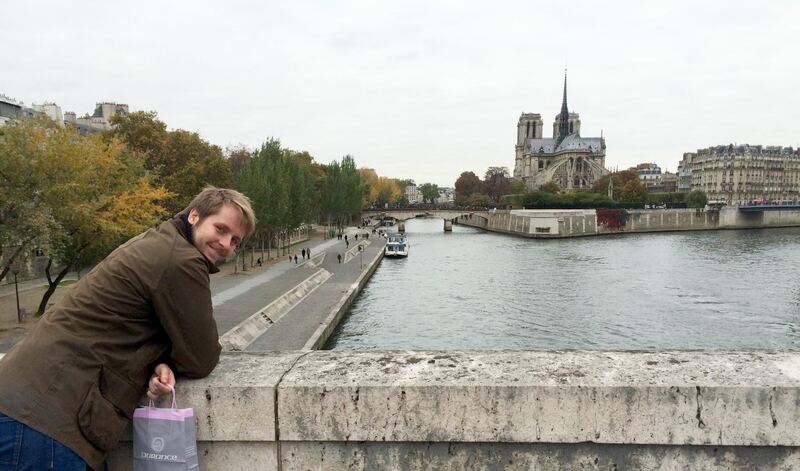 Right: Autumn selfie on Pont Neuf. 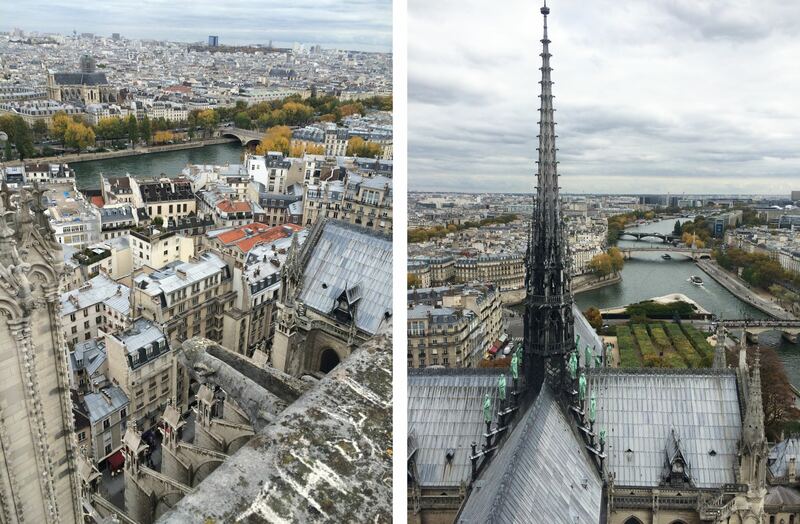 I’m a big fan of Île de la Cité, not just because it’s home to my favourite restaurant in the world, Le Caveau du Palais, but because it holds a great combo of sights to see: La Conciergerie, Sainte-Chappelle, and Notre-Dame. Square du Vert-Galant at the eastern edge of Île de la Cité. In the north of Île de la Cité sits the Conciergerie, a building that stands out from the surrounding architecture with a clean pale stone facade and wide corner turrets. This was where Marie Antoinette was imprisoned during the French Revolution before being executed, and you can visit the cell she was kept in on a tour around the old palace. The Conciergerie from the North river bank, over Pont au Change. The main benefit of visiting the Conciergerie, aside from the beautiful arching ceiling of its Hall of the Guards, is that you can buy a joint ticket for the Conciergerie and Sainte-Chapelle that lets you jump the queues. Got your joint ticket from the Conciergerie? Good news! 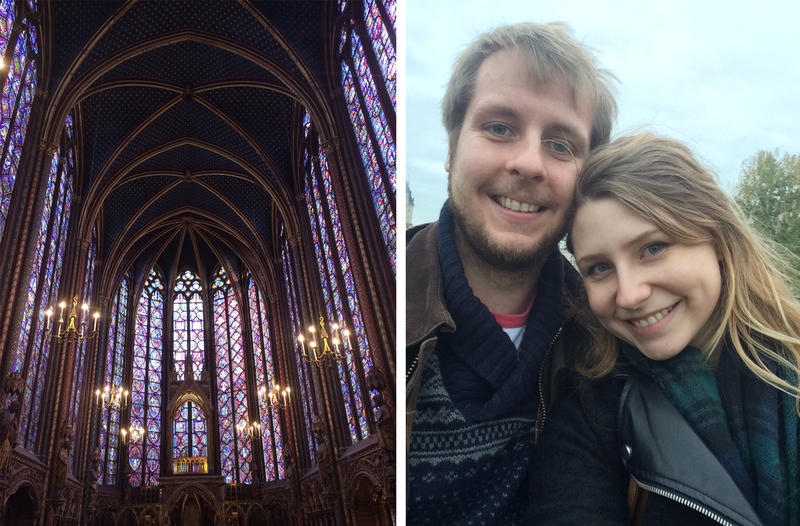 You now get to skip the insanely long queue into Sainte-Chapelle. Like the Conciergerie, Sainte-Chapelle was part of the old palace, built by King Louis IX to house holy relics, including Christ’s Crown of Thorns, the Holy Lance and fragments of the True Cross (now in Notre-Dame). It’s considered to be one of the greatest architectural achievements of the time, and although 2/3 of the stained glass windows are still original, much of the rest is recreated because of destruction during the French Revolution (are you sensing a theme yet?). Left: The upper level inside Sainte-Chapelle. Right: In case you forgot, I went there with Matt. As you can see, inside Sainte-Chapelle is a truly breathtaking sight. Once you’ve had your ticket checked you’ll enter the gift shop and climb up a tight spiral staircase to get to the upper level of the chapel. As you emerge at the top, the towering stained glass windows will reveal themselves all at once. You’ll spend the rest of your visit with your neck craned upwards, absorbing the gold starred ceiling, the intricately portrayed scenes in the windows, and the warm purple glow cast over everyone in the room. Arguably one of the most famous cathedrals in the world, the Notre-Dame de Paris is a stunning example of Gothic architecture, bristling with gargoyles, laden with statues and laced with intricately carved archways. Anyone who grew up with Disney movies will be deeply familiar with the symmetrical lines of Notre-Dame’s western façade, with the twin bell towers casting their long shadows over Place Jean Paul II. Outside the Cathedral are two queues to join – one to enter the cathedral and the other to climb the bell towers. If you have the time, I highly recommend you do both. The atmosphere alone inside the cathedral is serene and peaceful, the stained glass rose windows throwing geometric shapes of pink light on the sculpted walls and stone floors. The most striking feature for me, aside from the rose windows, is the monstrously large organ, with no fewer than 8,000 pipes. The route up to the bell tower spirals around stone stairways and weaves through pillars, archways and statues. 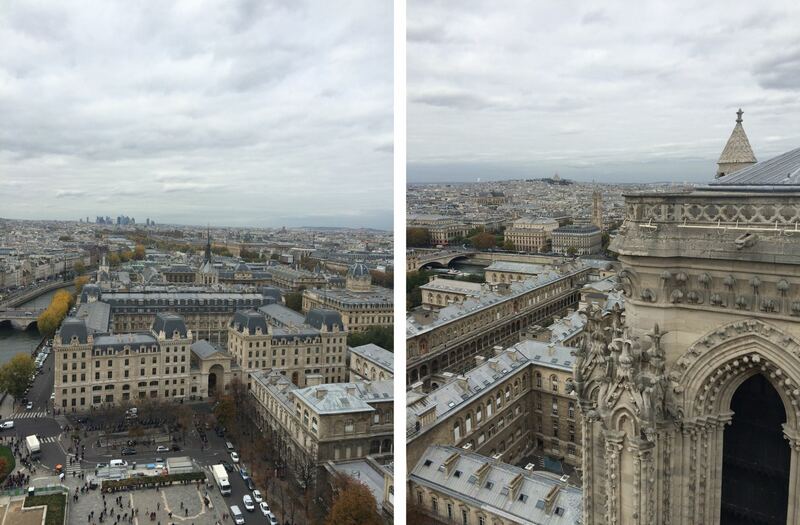 You’ll get to admire Paris from two levels – the base of the bell towers and the top of the southern bell tower. 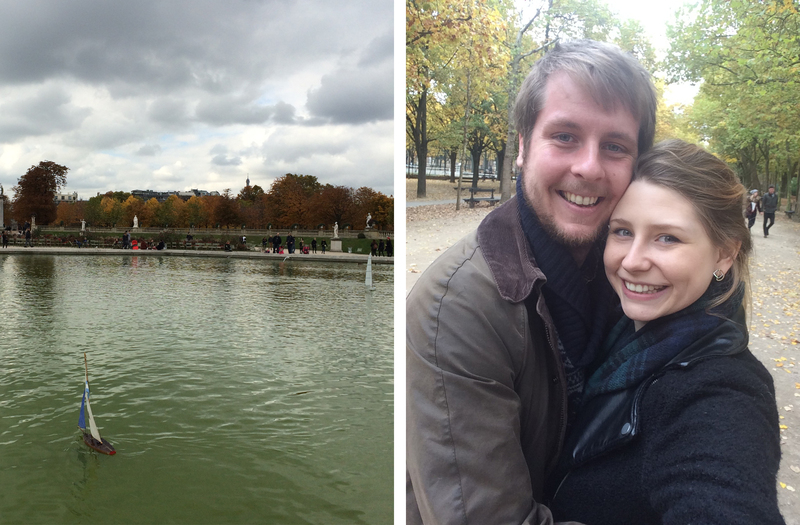 Side note, Matt’s had that left photo set as his Facebook cover photo ever since our autumn Paris trip in 2015. The second smaller natural island in the Seine is Île Saint-Louis. Home to artists and intellectuals, this mostly residential island is a calm oasis in the centre of Paris. Autumn leaves on Île Saint-Louis. The main road running down its spine is Rue Saint-Louis en l’Île, and it’s great for an afternoon stroll featuring little shops and boutiques, and of course Berthillon Glacier ice cream shop. 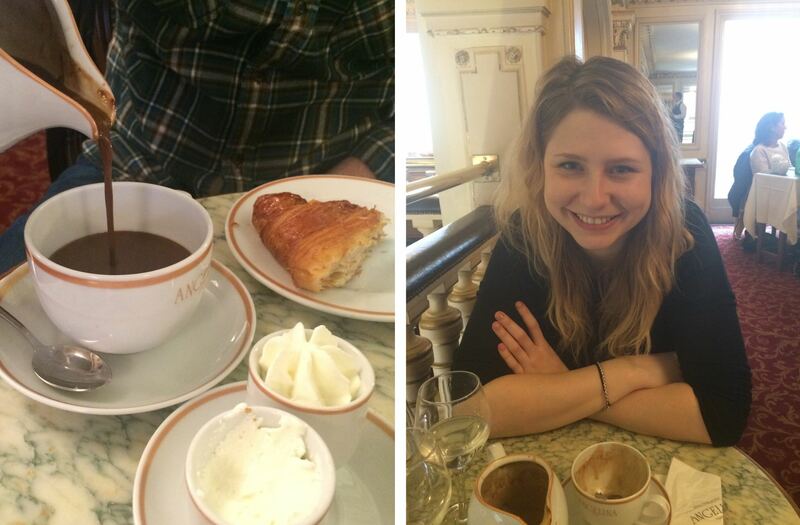 OK full disclosure, this day of our weekend was planned around my old haunts from living in Paris as a child. 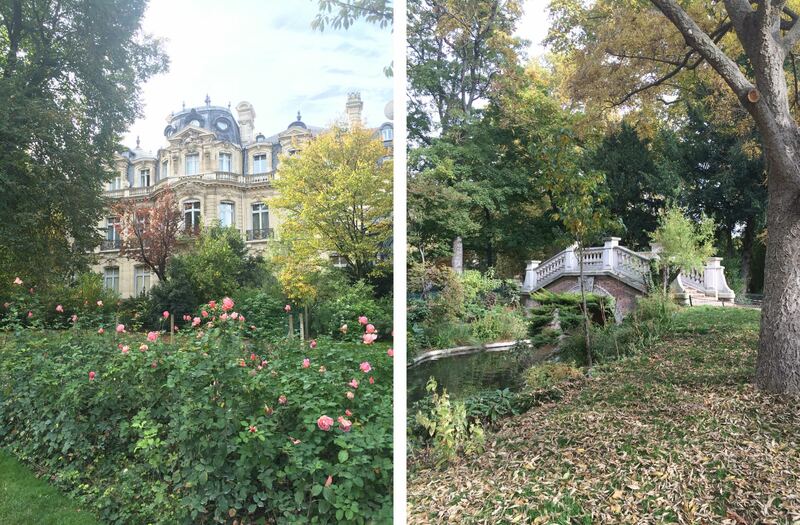 Parc Monceau served as our playground when I was at school there, but it’s so beautiful in Autumn that I seriously recommend you visit even though you have no personal connection. Like I said, Parc Monceau holds a special place in my heart, but it’s still worth visiting especially at this time of year. Also the apartment buildings around Parc Monceau are, in my opinion, some of the most beautiful in Paris. 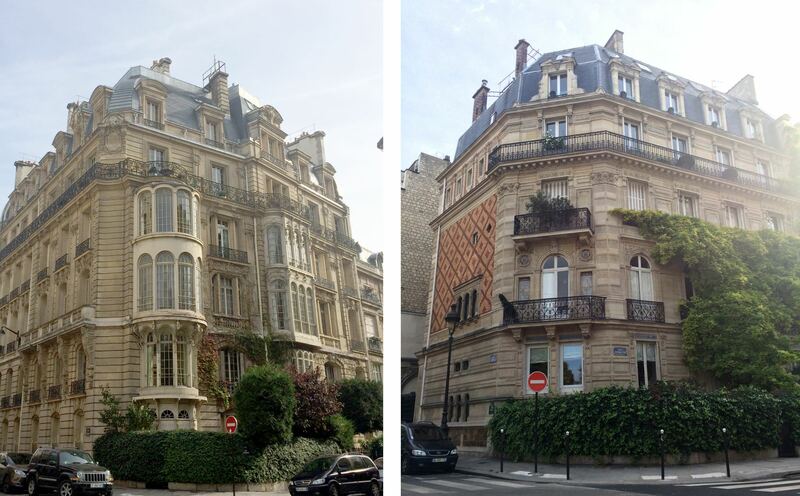 Beautiful apartment buildings on Rue Rembrandt, south of Parc Monceau. Parc Monceau has so many highlights – a large domed pavilion at the entrance, green lawns where Parisians can relax in the summer, a grotto with a waterfall, a roller rink, a vintage merry go round, kids’ play park and lots of gnarled trees that are perfect for climbing. The main green lawn in the centre of the parc. The park is quite unusual in France because of its historical English style with curved walkways and randomly placed statues. Dotted randomly throughout the park are a collection of scaled-down architectural features, or follies — including an Egyptian pyramid, a Chinese fort, a Dutch windmill, and Corinthian pillars. Left: Autumn leaves on Allée de la Comtesse-de-Ségur. Right: Park selfie. The park was bought by the city of Paris in 1860, and became the first new public park in Paris, part of the grand transformation of Paris begun by Napoleon. The architect built a bridge modelled after the Rialto bridge in Venice over the stream, preserving the other features from the original garden and embellishing the park with a rich collection of exotic trees and flowers from around the world. Left: Apartment buildings on the west side of the parc. Right: The Venetian bridge. 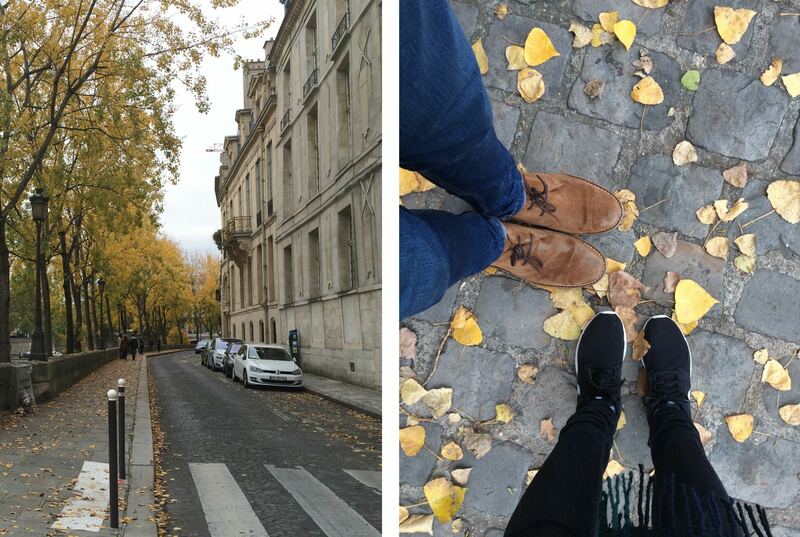 After admiring all the beautiful autumn leaves, we left the parc through Avenue Van Dyke we headed down Rue de Courcelles and over to Rue Gounod so I could show Matt my old apartment block. Ternes is a quarter in the 17th arrondissement, and the name of a specific roundabout on Avenue de Wagram leading up to the Arc de Triomphe. I really like this area because of two features. The first is FNAC (literally pronounced fu-nack), a massive department store that sells all kinds of entertainment from books and CDs to stereos and concert tickets. And on the very top floor is the comic book section. Called bandes dessinées or BDs, comics in France are not confined to children and nerds. They are read by a much broader base and as a result can be about anything from fantastic tales from ancient mythology to standard stories of mischievous school boys. Heard of Tintin? Asterix? The Smurfs? All originated as BDs. Need to retreat from the autumn weather? This is where you go. 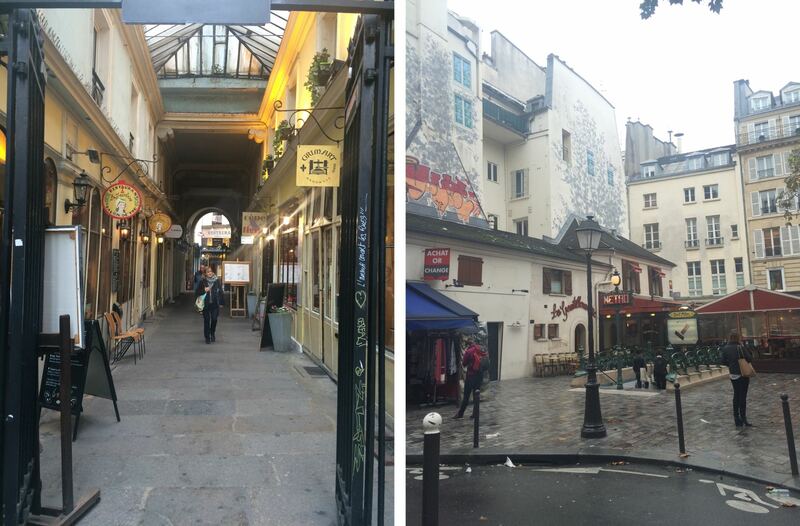 The second is Rue Poncelet, a market street behind FNAC where the shops spill out onto the street every day from 9am til 1pm, and again from 3pm til 7pm (except Mondays). 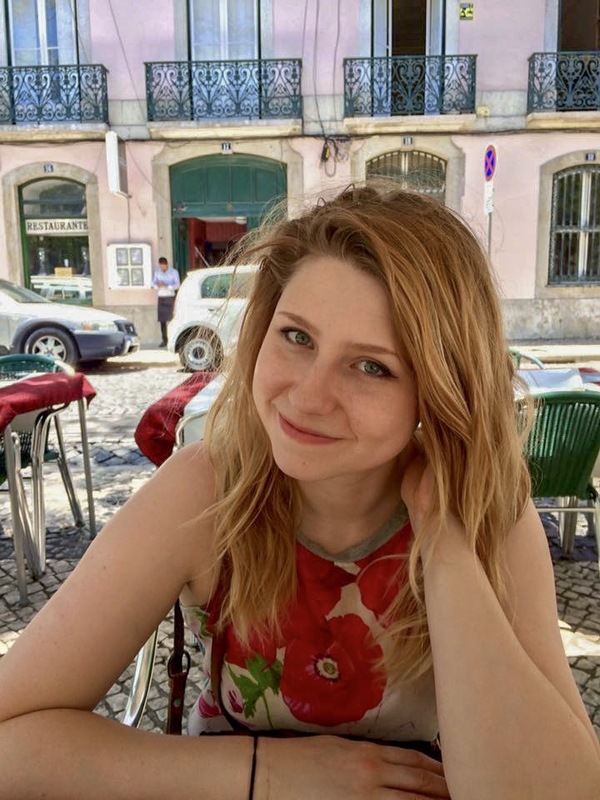 Fruits, vegetables, fish, live shelfish, meats and much more on display, the street teaming with locals haggling with the shop owners – this is a great place to come for a proper French market with a friendly atmosphere. The Trocadéro at night is a whole other experience. 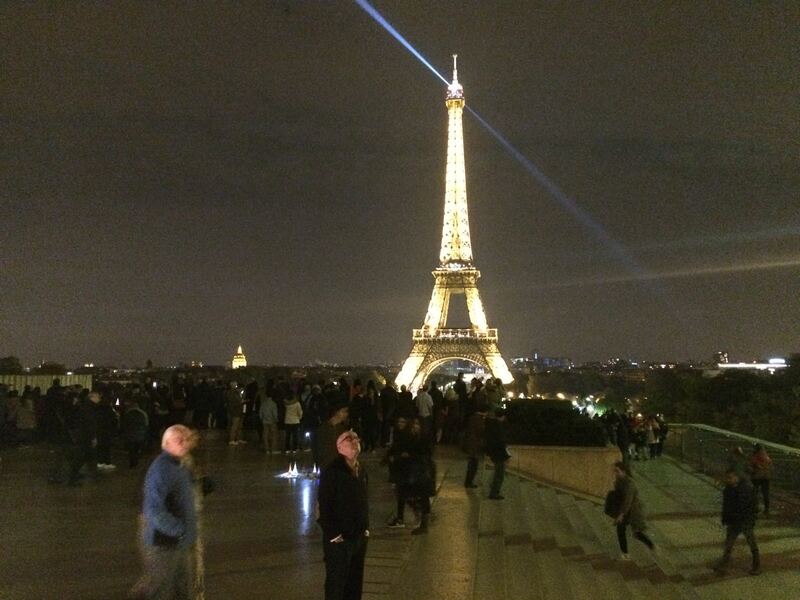 The illuminated Eiffel Tower with its spotlights sweeping around Paris are a sight that can only be fully appreciated from the Place de Trocadéro. Time your visit on the hour to witness the unmissable sparkling lights – a “temporary” feature installed for the millennium that everyone loved too much to take down! It doesn’t matter what time of year you visit, make sure this is on your itinerary. It’s one of the most romantic sights in the world, and you’ll find yourself joining in with the crowd’s collective “Ooooh!” when the lights start. I recommend planning it for the last evening of your holiday. The Jardin du Luxembourg was created in 1612 by Marie de’ Medici, the widow of King Henry IV, as gardens for the Luxembourg Palace. It covers 23 hectares and is famous for its lawns, tree-lined promenades, flowerbeds, and the Medici Fountain. 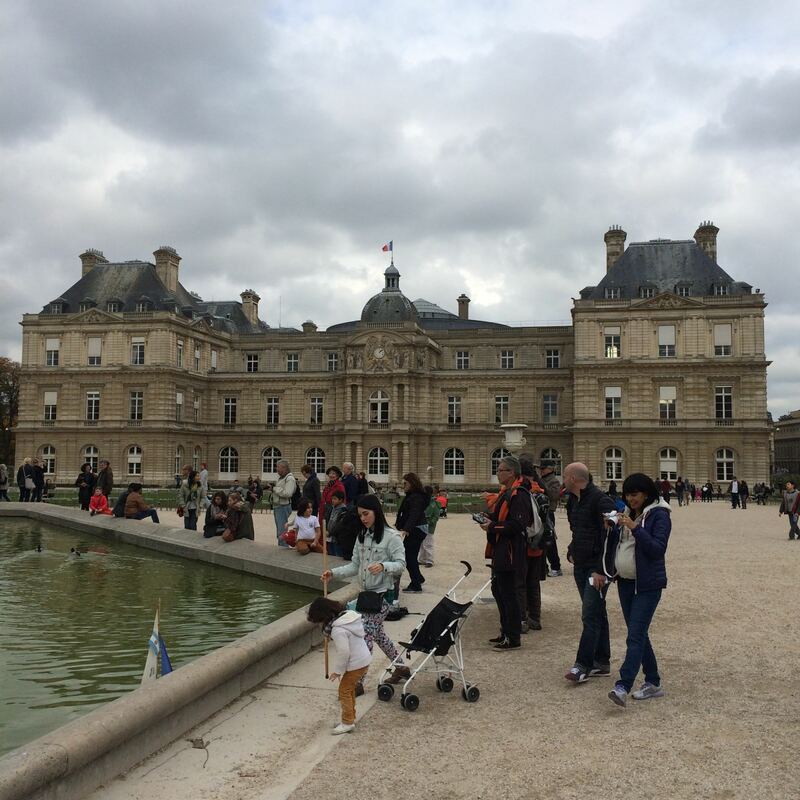 The Luxembourg Palace in the 6th arrondissement. These gardens are a great place to take kids. The large circular pond behind the palace is usually covered in little model sailboats, which you can rent if you’re so inclined. There’s also a big playground called the Poussin Vert with quite a complicated zip-line. Left: Model sailboats can be rented on the main pond. Right: Autumn garden selfie. 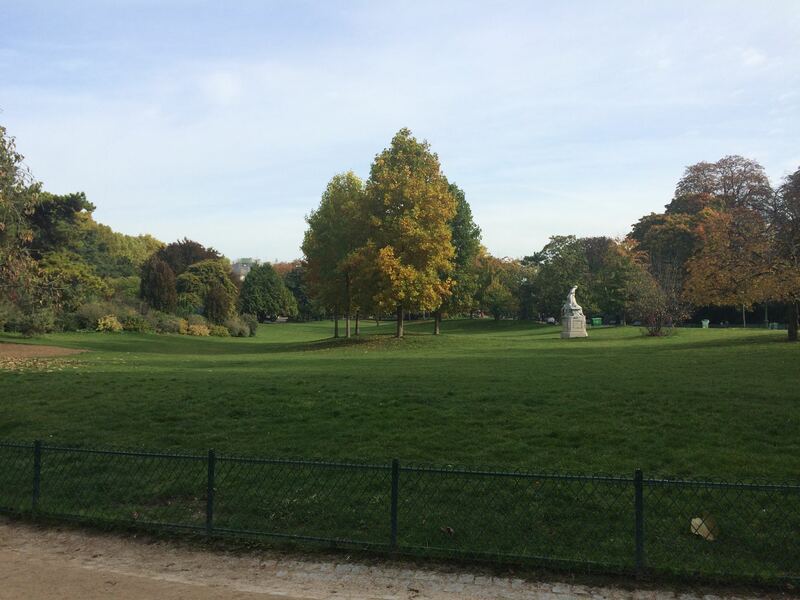 Autumn is the perfect time to visit the Jardin de Luxembourg because there are so many trees around the lawns and promenades. 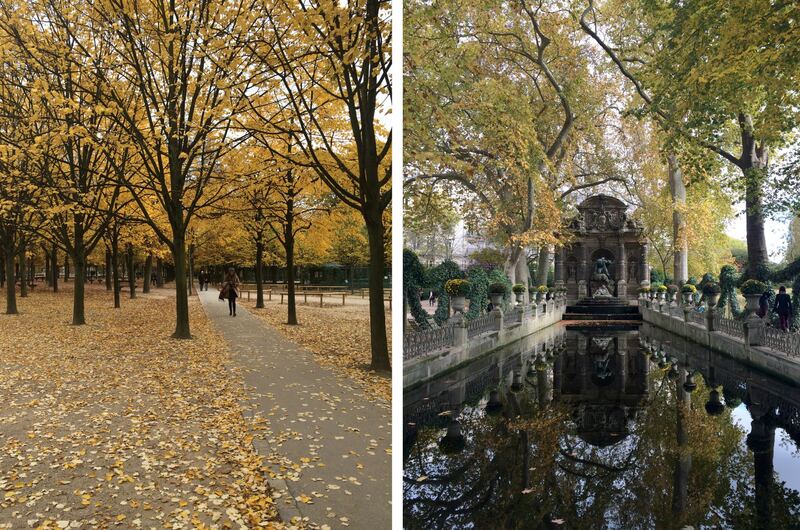 Left: Tree lined promenades with autumn leaves. Right: Marie De Medicis Fountain. 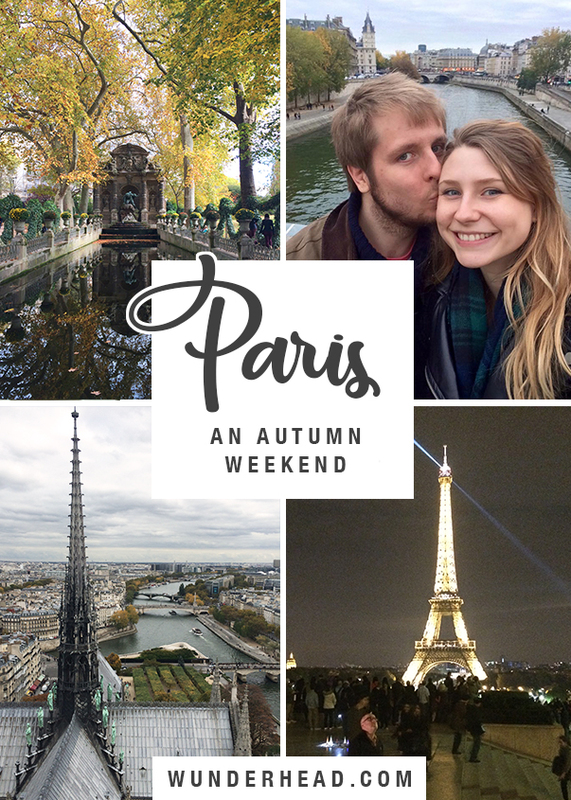 Autumn is a great time of year to go to Paris, especially if you love strolling around beautiful parks, exploring galleries, shopping in markets, and retreating into cafes.